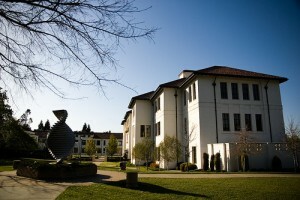 The 2019 Nonviolent Leadership for Social Justice Intensive will be held at Saint Mary’s College of California, in Moraga, CA. 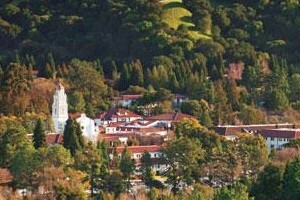 Saint Mary’s has a beautiful campus 23 miles east of San Francisco, distinguished by the white walls and red tile roofs of its Spanish Renaissance-California Mission-style architecture, and surrounded by grass-covered hills crowned with morning mists blown in from the Pacific. Housing will be on campus in apartment and suite style residence halls. Single and double occupancy rooms with shared bathrooms will be available. 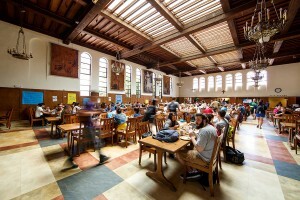 The main dining hall at St. Mary’s offers a variety of food choices for vegetarian, vegan and omnivore diners. We will pass along participants dietary restrictions to the chefs, and while the dining hall can accommodate a range of diets, we ask that you bring with you any special food items that you need to ensure your health and well-being. The campus offers a variety of opportunities for outdoor relaxation and play, from spacious common areas, to hiking trails, ball courts, and gardens. 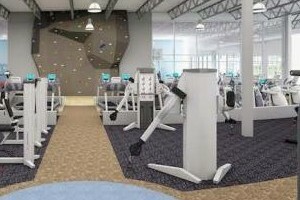 Participants of the NLSJ retreat will be able to purchase a pass to St. Mary’s extensive fitness facility, which hosts a well equipped weight room, pool, and a range of exercise machines. Summer in Moraga is a lovely time to be outdoors, with average daytime highs in the low 80’s, and nighttime lows in the 50’s. Plan to bring clothing to layer to accommodate the wide temperature range. We will provide information prior to the retreat about what you need to bring to support your stay.